Award for the best food packaging to BEHER for its Iberian cured ham vacuum packed in Sacovitta (self-adhesive plastic bag). 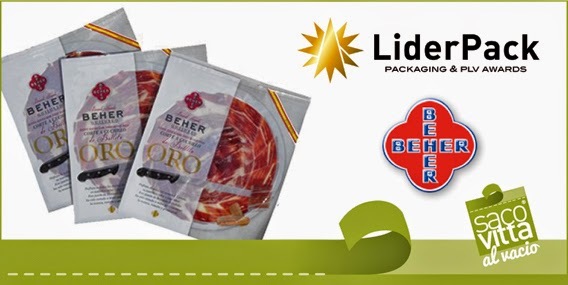 LIDERPACK DE ORO for the Bellota Oro Iberian ham prepared by BEHER – Bernardo Hernández for its vacuum bag printed in full colour. Practical container with high quality product visibility. White tones rarely seen in packs of Iberian ham. Complete information printed on the back. The pack itself is used to preserve the product after opening, due to its self-adhesive strip. Eliminates costs of cardboard boxes.